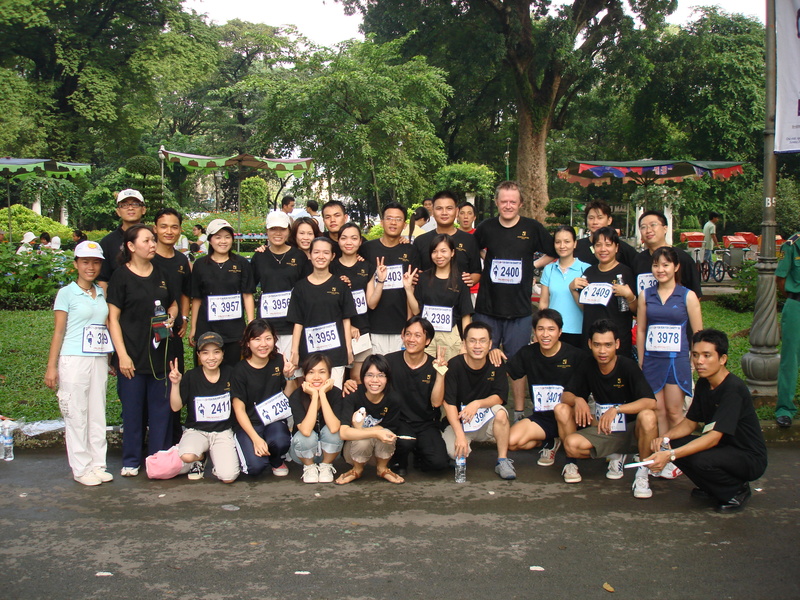 The annual BBGV (British Business Group in Vietnam) Charity Fun Run took place in HCMC yesterday, and this year the Duxton got involved as a food sponsor and by entering a team of around 40 runners. Our catering team did a great job of serving over 1000 hot dogs to those taking part, and we ran out of food much earlier than we thought – those hot dogs must’ve been good! As for the running, it was tough going as, despite the early start (0645), it was extremely humid, and it must also be said that the police didn’t do a very good job of closing off the roads, leaving runners to jockey with motorbikes on several stretches of the route. Surely it’s not too much to ask for these people to respect a charity event and stay off the roads for half an hour? But anyway a good time was had by all, and congratulations to Mr Pham Van Tuy (F&B) and Ms Tran Thi Ngoc Chau (Engineering), who won the Duxton 1st male and 1st female prizes. Me? I staggered in a few minutes behind, sweaty but happy at beating my 2007 time by 5 minutes!